This glossary for swim students is in two sections: this page of basic swimming vocabulary and another page of vocabulary to be able to understand workouts Swim workout vocabulary . At De Anza College we teach classes for all levels of swimming, from people who are afraid to get into a pool to quite advanced swimmers working on long distances for ocean races. Some of my students in the college introduction to swimming class, novice swimming, have literally never been in a pool before, other students swim a mile a day. This glossary will attempt to explain vocabulary to all levels of swimmers and/or non-swimmers. Swimming can be done at the surface on your stomach, back or side, as well as underwater. stomach, and uses a pull (arm motion) of both arms at once, and a kick (leg motion) of both legs at once. The kick is called a dolphin kick. Backstroke, racing backstroke, or back crawl (these names are also used interchangeably by most swimmers) is the fastest stroke swum on the back. The arms alternate their pull and the legs alternate their kick. This kick is called a flutter kick. Breaststroke uses a pull with both arms at once, and the arms stay in the water. Likewise both legs kick at the same time using a frog kick, modified frog kick or whip kick. This was the main stroke for competition in the 1800s, before freestyle was developed. See: History of swimming section. Also at swim races, the Individual Medley (IM) is swum by one person versus other individual swimmers, with the strokes above, in the order described above. Sometimes the names are shortened to Fly, Back, Breast, Free. The same distance of each is swum, totaling 100 yards, 200 yards/meters or 400 yards/meters. A relay is swim by four members of the same team against four members of each other team at a race. A freestyle relay would have each swim a distance of freestyle, and as they get to the side of the pool, the next person in the relay dives in and starts swimming the same stroke/distance. A medley relay would have four swimmers each do one distance of the IM strokes in the order Back, Breast, Fly, Free. A leg is one section of a relay. The anchor is the last swimmer in a relay. Sidestroke is swum on the right or left side. The leading arm pulls from in front of the swimmer down to about chest level, the other arm starts the pull just above where the first arm finishes and pulls down to the hips. The kick is called a scissors kick as it resembles scissors closing. along the sides of the swimmer. A whip kick, dolphin, flutter or frog kick is used. Dog Paddle is a human swimming like a dog. Panting is not required. Drowning moth is what a swimmer’s first attempt at butterfly often looks like. Underwater swimming has a pull much the same as breaststroke but pulling all the way down the side of or under the swimmer. Many different kicks are used. Treading water , sometimes referred to as swimming in place, is not a stroke. It is a set of leg actions and arm actions used to keep a swimmer’s head above the water while the body is vertical, (as opposed to swimming, when the body is horizontal). Water polo players depend entirely on the leg action/strength when their hands are busy handling the ball. Lifeguards depend entirely on their leg action when, for example, they are strapping a victim to a backboard in deep water. The leg action can be a scissors kick, whip kick or an eggbeater (the legs move much as a hand-powered egg beater does). A flutter kick is not effective for treading water. The hand motion, when it is used, is sculling. It can be compared to spreading frosting on a giant birthday cake. By properly waving the hands back and forth through the water, the swimmer creates a force perpendicular to the direction of motion. Swimmers who are used to sculling automatically (it seems as if they do not need to think about it) make small changes in the pitch and/or speed of their hand movement to adjust the force as needed to stay in one place, turn or move. Sculling can be used alone to help maintain a steady position and/or horizontal position in the water during a float. Synchronized swimming, the water ballet performed by a single swimmer, by pairs or groups of up to eight swimmers, depends in part on strong sculling skills. Sculls include the flat, head-first, feet-first, canoe, torpedo and support scull. Hypoxic training is a workout with limited breathing and therefore a limited intake of oxygen. No hypoxic training or attempts at lengthy breath holding are allowed in my classes without permission and an instructor or lifeguard watching you. swim class safety rules has more details about how unsafe (or even deadly) lengthy breath holding can be. There are many kinds of diving. Dives are head-first (or rather, for safety the hands enter first) entries into water. Some of my novice swimmers mistakenly refer to jumping feet first into a pool as a dive, but it is not. Surface dives are used to get from the surface of the water to underwater. They are usually done feet first or involve a somersault head first. Springboard diving (formerly fancy diving) uses a diving board. 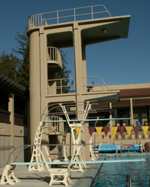 The diving boards at De Anza College are one meter and three meter, the distance from the board to the surface of the water. We used to have two platforms, one five meters from the water surface and one ten meters. Some pools also have one and 7 meter platforms. Diving boards and platforms are referred to as apparatus. The use of any board or platform is with permission only at most pools and in most swim classes. Diving vocabulary: Most boards have a fulcrum, a wheel along the side that can be used to adjust the stability/stiffness of the board. The takeoff may be facing forward or backward. Each forward dive has a moving start, with an approach (at least three slow steps as the diver walks to the end of the board) and hurdle (the jump at the end of the board). The press is the diver’s downward push on the board, the lift is the force of the board pushing a diver unto the air. diver can use a free position, their choice of position. A ripped entry refers to when a diver enters the water without excessive splash. The score on a dive in competition is determined by the degree of difficulty of the dive and the judge’s scores. A reader asked how deep water should be under a diving board. 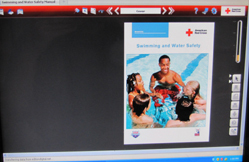 The answer can be found in the Red Cross Water Safety Instructor’s manual, 2009. 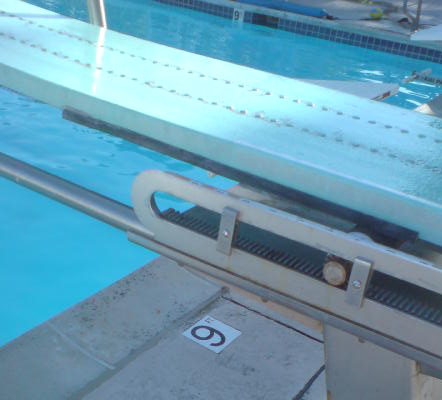 Minimum depth of water under a 1 meter diving board directly under the tip of the board should be 11 feet 6 inches. This book also notes that goggles should never be worn during teaching of head first entries. Racing dives or shallow dives are those from the side of the pool. Only trained divers should try these dives. They are not safe if done into water less than five feet deep. People should be taught in water that is at least nine feet deep. They are also called starts, as in a race, and come in various styles, such as grab starts and track starts. A backstroke start is begun at the surface of the water, but the swimmer takes off momentarily into the air. one per lane, for starts. Untrained people are greatly at risk if they use them at shallow water. A start can also refer to the starting (blank, not real) gun, buzzer, or beep / tone from a computerized timing system that starts the swimmers in a race. Omega and Colorado are brands of timing systems. A false start is when a swimmer leaves a starting block early or otherwise starts a race before the horn or gun sounds. At many races one false start disqualifies a swimmer from that race. A dive done improperly can turn into a belly flop when a diver lands horizontally, on his stomach instead of slipping into the water cleanly at an angle. It is usually caused when the diver lifts his head, which is a common mistake, so belly flops are common. lessens the impact by as much as 80%. A cannonball is an intentional entry for fun into the water, usually from a board, but also from the side of the pool, with the person’s body tucked into a ball as they hit the water. Cannonballs can be used in a recreational competition and ‘judged’ by the height / width / symmetry of the splash. A can opener is a variation with one leg pulled up to the body and the other straight. Either can be aimed with the intention of splashing people on deck. turns are usually the first taught. Flip turns are faster and require a somersault underwater. Swimmers sight on the ‘T’ painted on or in tiles on the bottom of the pool at the end of the lane to know when to start their flip turn. Swimmers generally refer to the bottom of the pool when they swim downwards, rather than the floor, which some of my novices call the bottom surface. The depths at the bottom are usually marked along the edge or sides. Some pools have a deep end and a shallow end, and the bottom can slope gradually or suddenly from shallow to deep. There is usually a line painted on the bottom and a floating line at the surface where there is a sudden drop off. A diving well is a separate pool with only deep water. The diving well at De Anza College is 14 to 16 feet deep. The vertical portion of the pool can be called the side or wall. Sometimes it has a touch pad to record times on a computer. Some pools have the water surface right at the top of the pool wall; others have a gutter that runs all the way around the pool circumference. If you stand at the edge of the De Anza College pool and look straight down you can see that the pool gutter sticks out farther than the deck edge. If you decide to jump in you need to be certain that you jump out far enough from the edge that you don’t hit your tailbone on the gutter. Unfortunately people don’t always look before they leap into a pool and sometimes have jumped on a swimmer underwater near the pool edge. A bulkhead is a platform across the width of a pool that can be moved to change the length of a section of the pool. Swimming under a bulkhead to get from one section of a pool to another is usually against pool rules. Diving from a bulkhead is also usually not allowed. When people are swimming back and forth it is referred to as lap swimming. by swimmers, thus improving speeds. Lane lines should be used only for temporary support. 4) submerges it so it can’t be seen (especially important if it is a swim area boundary). When the lane lines are set in the bigger De Anza College pool across the width, the swimming is sometimes referred to as short course. When they are set along the length, they are sometimes referred to as long course. When there are two or more swimmers in a lane they should circle swim. Each swimmer swims on the right side, staying close to the lane line. Always stay to the right of the line on the bottom of the pool. If each swimmer leaves the wall 5 seconds apart there is plenty of space between each person in the lane. If there are only two swimmers in a lane they can decide to split the lane, each swimming back and forth on one side. When someone gets tired they can tuck into a corner at the end of the lane so they won’t interfere with another swimmers turn. 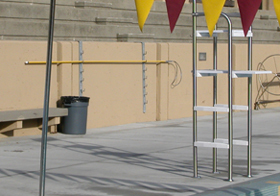 The ones at De Anza College are in the school colors, burgundy and gold, but they are not just for decoration, they are for people swimming on their back to be able to look at and judge when they are coming near the wall (the side of the pool) so they will not hit their head. 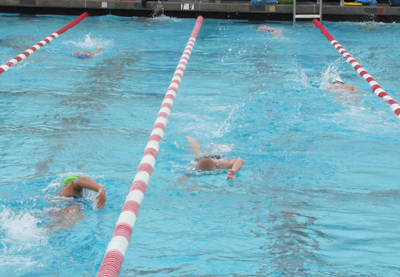 Many advanced swimmers are able to start a turn without actually seeing the wall, but just by counting the pulls of their stroke from the flags. A lap on a track is one time around, but in a pool most people refer to a lap as once across the pool. Some coaches and swimmers refer to lengths to avoid confusion. Two lengths can also be referred to as down and back. A mile (5,280 feet) would be 70 1/2 widths of the De Anza College pool, or 70 1/2 laps. A mile is also slang for a 1500 meter or 1650 yard freestyle race, both of which are not really a mile distance. Floating idly in the pool can be quite pleasant. Relax and feel the sunshine on your back, stare at the bottom. But out of courtesy to others, so your instructor, coach, the lifeguard or other swimmers won’t wonder if you are capable of holding your breath for a long time or if you have passed out, Any person who wants to float without moving should signal that they are okay by giving a ‘thumbs-up’ signal. Even if others at the pool you are at are not familiar with this courtesy, they should be able to understand it. Waterpolo goals are usually made of netting and a rectangular wood or plastic frame. Water polo is a deep water soccer/rugby. In competition it is played by teams of either gender, but for fun everyone often plays together. It evolved in the late 1800s from a mild game played at resorts to a dangerous game before it became a skilled sport in later years. (In early years players were sometime held underwater and the opposition goal keeper was allowed to stand on the edge of the pool and may have dive bombed opposing players as they tried to score.) See: History of swimming section 1863. Most pools will have a piece of rescue equipment hanging on the wall, a shepherd’s crook. a 12 foot round circle to a 21 by 41 foot oval. It is never safe to dive into an above ground pool. swim fins, hand paddles, (probably invented by Benjamin Franklin in 1716, History of swimming section ) webbed gloves, and pull buoys (two small cylinders of stryrofoam with a strap joining them, placed between the knees to give legs buoyancy so a swimmer can concentrate on practicing the pull / arm stroke only) Some people refer to pull buoys as blocks, but that usage is not that commonly used. 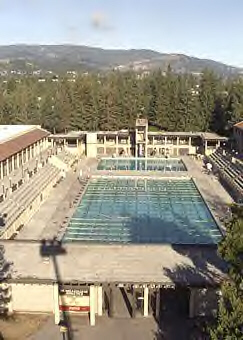 EPOOL refers to the east end of the De Anza College Olympic sized pool. This is the shallow end with water up to 5 feet deep. Novice swim classes, some beginning swim classes and water exercise classes are held there. MPOOL is the middle section and WPOOL is the west end of the pool. Both are in water that is at least 6 to 7 feet deep. DWELL is the diving well, the second pool at De Anza College. It is 14 to 16 feet deep. It’s where the water polo team practices and where swim classes go to work on springboard diving. This page has been linked to by various English as a Second Language (ESL) instructors, including an upper level secondary school in France. Such use of the page is encouraged. The Navy Seal swim test, Naval Academy midshipmen’s test, a prerequisite for an “Escape from Alcatraz” 1-1/2 mile ocean swim and others are at: How can I tell if I’m a good swimmer? 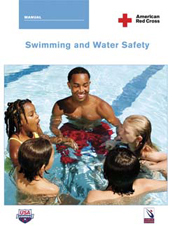 (This had no index, so I wrote one: Swimming and Water Safety 2009 index).